A surprising new finding indicates that a third of all stars are far, far away from the places they were born in the Milky Way. A new video map of the Milky Way has the scientific community talking after it found that a full third of stars are far away from where they were born in our galaxy. The Sloan Digital Sky Survey-III (SDSS), which uses the 2.5-meter wide-angle optical telescope at Apache Point Observatory in New Mexico, was used to allow astronomers to spot the chemical elements that make up a star using spectroscopy, and then they were able to figure out where these stars began based on areas of the galaxy that are known to contain large quantities of those elements, according to a Discovery News report. 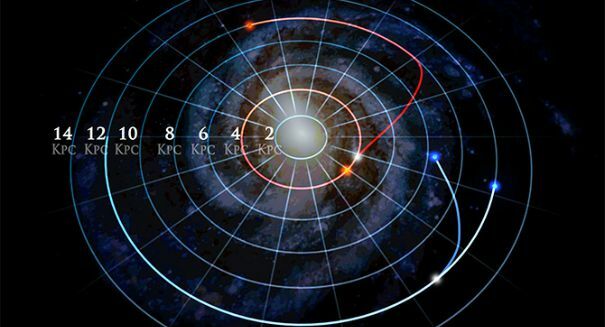 And the findings were shocking: about 30 percent of all stars in the Milky Way are believed to be hurtling through the galaxy on entirely different courses that have brought them to regions of the galaxy very different from where they started out. A total of 70,000 stars were measured during the survey using the infrared spectrograph of SDSS. Donald Schneider, a co-author of the study who works at Penn State University, said according to the report that this is basically “galactic archaeology.” Astronomers are able to take clues from the surrounding environment of a star, such as their location, motions, and chemical composition to come to a rough estimation of how long ago they formed — just like how archaeologists here on Earth use clues from the surrounding environment to age artifacts and figure out where they came from. Scientists are able to measure the spetroscopic signature of a star to spot the heavier elements in the atmosphere of certain stars, using them as a chemical fingerprint to find out when they formed and where in the galaxy they started out. What this finding indicates is that the composition of a galaxy like the Milky Way is anything but static: stars die, they give off their heavier elements which go back into the gas clouds, and then those clouds form new stars. Some stars careen inward into the galaxy closer to its center, while others go outward — an irregularity that appears due to the uneven distribution of mass insider our galaxy.